Did you know? The IRS has implemented competency testing and continuing education requirements for paid tax preparers. If you are a paid tax preparer, check out our tax school! We have the information you will need to pass the test. We are offering courses you will need to meet your continuing education requirements and prepare for the test. If you are a taxpayer searching for a tax preparer, make sure your preparer is registered with the IRS and is keeping up with their continuing education. We will be offering all of the continuing education hours you will need to retain your status as a Registered Tax Return Preparer. Our first course will give you the required 10 hours in Test Preparation. This course will help you prepare for the IRS competency test. It includes 8 chapters of instruction with practice exams at the end of each chapter.They will not be included in your final grade. There is a final exam at the end of the course. We will allow you three tries to pass the exam. The second course is Ethics. As a tax preparer, whether you are titled an Enrolled Agent or a Registered Tax Return Preparer, you are in an extremely competitive market. The pressure to give your client the biggest refund, or the smallest balance due is intense. This course will explain the ethics requirements of the tax professional. It will cover the oversight and penalties to which tax preparers are subject, as outlined in Circular 230. It will also explain the due diligence requirements of the tax professional. It includes 3 chapters of instruction.. There are interactive Reviews at the end of each Chapter for practice. They will not be included in your final grade. There is an exam at the end of the course. We will allow you three tries to pass the exam. The third course is Federal Tax Law Updates. This course will explain the new tax laws while giving you 3 hours of continuing education credit. It will cover the changes that occurred in 2011, as well as changes for the 2012 tax year as they stand now. Tax laws change every year. In order for us, as preparers, to give our clients the best service possible, we must keep up to date on the new tax laws.It includes 2 chapters of instruction. There are interactive Reviews at the end of each Chapter for practice. They will not be included in your final grade. There is an exam at the end of the course. We will allow you three tries to pass the exam. 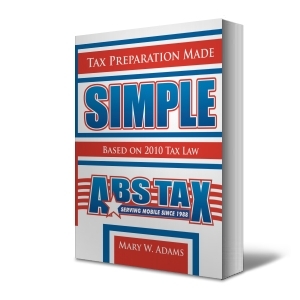 Once you have finished the courses with a 70% or better grade, you will receive a beautiful, color, certificate of completion from the ABS Tax School for each course. We will also inform the IRS of your completion. For only $200, you will be able to study at your own pace. You will receive email support by the author of the tax course, an enrolled agent. Click the link below to get started! Once you have paid, you will be directed to the registration page. You can purchase all three for one price of $200 by clicking the link directly below. Registration is closed for 2012. We will post 2013 courses soon! We will be offering all of the continuing education hours you will need to retain your status as a Registered Tax Return Preparer. Our first course will give you the required 10 hours in federal tax law matters. It is titled The Self Employed Taxpayer and will teach you everything you need to know about doing a small business tax return. You will learn how to prepare the tax returns from the beginning of the business to the end. It includes 4 chapters of instruction with comprehensive examples. This course will provide you with 10 credit hours for Federal Tax Law for only $125. Once you have finished the course with a 70% or better grade, you will receive a beautiful, color, certificate of completion from the ABS Tax School. We will also inform the IRS of your completion. The credit hours apply to RTRP's as well as EA's. For only $125, you will be able to study at your own pace. You will receive email support by the author of the tax course, an enrolled agent. The course will teach you how to prepare returns for small businesses. You will learn how to prepare the tax returns from the beginning of the business to the end. It includes 4 chapters of instruction with comprehensive examples. There are interactive Reviews and Exercises at the end of each Chapter for practice. They will not be included in your final grade. There is an exam at the end of the course. We will allow you three tries to pass the exam. Click the link below to get started! Once you have paid, you will be directed to the registration page. Registration is closed. We are in the process of updating. This course will explain the new tax laws while giving OTRP's and EA's 3 hours of continuing education credit for only $45. It will cover the changes that occurred in 2014, as well as changes for the 2015 tax year as they stand now. It will also cover changes that are slated to occur in 2016. There will be an emphasis on the Affordable Care Act. For only $45, you will be able to study at your own pace. You will receive email support by the author of the tax course, an enrolled agent. This course will provide 3 credit hours to both RTRP's and EA's. Once you have finished the course with a 70% or better grade, you will receive a beautiful, color, certificate of completion from the ABS Tax School. We will also inform the IRS of your completion. It includes 3 chapters of instruction. There are interactive Reviews at the end of each Chapter for practice. They will not be included in your final grade. There is an exam at the end of the course. Once you pass the exam, you have completed the course. Click the link below to get started! Once you have paid, you will be directed to the registration page. This course will provide you with 10 credit hours for Test Preparation for only $125. Once you have finished the course with a 70% or better grade, you will receive a beautiful, color, certificate of completion from the ABS Tax School. We will also inform the IRS of your completion. For only $125, you will be able to study at your own pace. You will receive email support by the author of the tax course, an enrolled agent. This course will help you prepare for the IRS competency test. It includes 8 chapters of instruction with practice exams at the end of each chapter.They will not be included in your final grade. There is an exam at the end of the course. We will allow you three tries to pass the exam. Click the link below to get started! Once you have paid, you will be directed to the registration page. Registration is closed. We are in the process of updating. This course will provide RTRP's and EA's with 2 credit hours for Ethics for only $30. As a tax preparer, whether you are titled an Enrolled Agent or a Registered Tax Return Preparer, you are in an extremely competitive market. The pressure to give your client the biggest refund, or the smallest balance due is intense. This course will explain the ethics requirements of the tax professional. It will cover the oversight and penalties to which tax preparers are subject, as outlined in Circular 230. It will also explain the due diligence requirements of the tax professional. Once you have finished the course with a 70% or better grade, you will receive a beautiful, color, certificate of completion from the ABS Tax School. We will also inform the IRS of your completion. For only $30, you will be able to study at your own pace. You will receive email support by the author of the tax course, an enrolled agent. The course will teach you the ethics involved in tax return preparation. It includes 3 chapters of instruction. There are interactive Reviews at the end of each Chapter for practice. They will not be included in your final grade. Your final grade will be determined by the final exam at the end of the course. You will need to make 70% or better to pass. If you fail the exam, you will be able to retake it until you pass. Our online tax course is 19 chapters of tax information, including the Affordable Health Care Act, and is based on 2017 tax law. It uses step by step training and comprehensive examples to guide you through the process of preparing a tax return. There are interactive reviews at the end of every chapter. There are 6 quizzes and two exams in the course. Once you have finished the course with a 70% or better grade, you will receive a beautiful color certificate of completion from the ABS Tax School. With a one time membership fee of $200, you will be able to study at your own pace. You will receive email support by the author of the tax course, an enrolled agent. When you have finished the course, you will be surprised at how easy preparing a tax return is! Note: This course will not result in any continuing education hours. Sign up to receive updates about our tax courses!